02/03/2019 - The Hershey Bears closed the weekend with a 3-2 shootout win over the Belleville Senators on Super Bowl Sunday at Giant Center. Riley Barber scored the lone goal in the shootout, Vitek Vanecek turned aside 27 of 29 shots, and the Bears extended their point streak to nine game in the win. For the 14th time in the last 15 games, the Chocolate and White drew first blood and opened the scoring. At 7:11, Shane Gersich used a burst of speed through the neutral zone to break free behind the defense. A sneaky move beat Senators goaltender Filip Gustavsson five-hole for Gersich's sixth goal of the season. The Sens received their first crack on the power play at 9:33 after Steve Whitney was called for hooking, and Belleville took advantage only 15 seconds later. Jack Rodewald scored unassisted after banging home a loose puck in the blue paint past Vanecek at 9:48. Hershey responded only 55 seconds later to retake the lead on an odd-man rush. Whitney raced up ice along the right wing with Mike Sgarbossa to his left. After a perfect pass was handled by Sgarbossa, he went to the backhand to hit pay-dirt. Shots on goal after 20 minutes were 9-6 Bears. Following an event-less middle frame, the B-Sens tied the game only one minute into the third period. After an acrobatic stop by Vanecek while moving laterally, Drake Batherson potted the rebound to even the score. Three power play chances in the third period followed for Hershey, but were unable to convert. The Bears finished the evening 0-for-7 on the man-advantage. At 16:27, Nathan Walker was assessed a match penalty for kneeing. The play resulted in a five minute major power play for Belleville and a game misconduct for Walker. Hershey killed the major penalty for the remaining 3:33 in regulation, and for the first 1:27 of sudden-death overtime. After both teams saw their penalty kill produce in the clutch, the 2-2 score was broken in a shootout. Riley Barber scored in the top of the first round, and Vanecek stopped all three shooters to help the Bears to a 3-2 win. In Hershey's nine game point streak, the Bears have claimed 17-of-18 possible standings points. Hershey's record improved to 23-20-0-3 on the season. 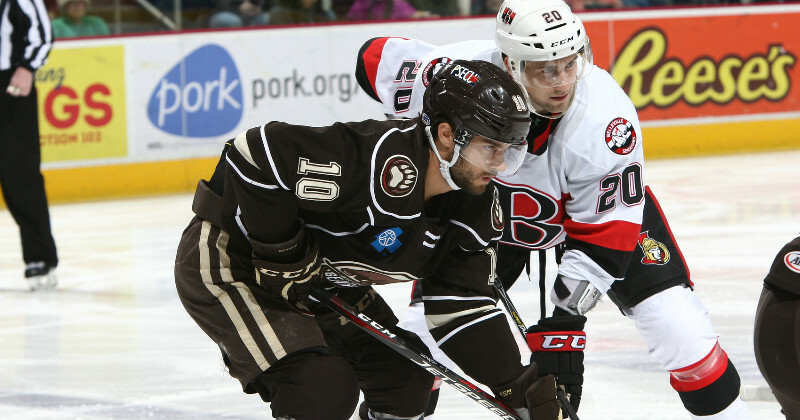 The Hershey Bears return to the ice on Wednesday, Feb. 6 against the Springfield Thunderbirds. Puck drop is scheduled for 7:05 p.m. from the MassMutual Center.